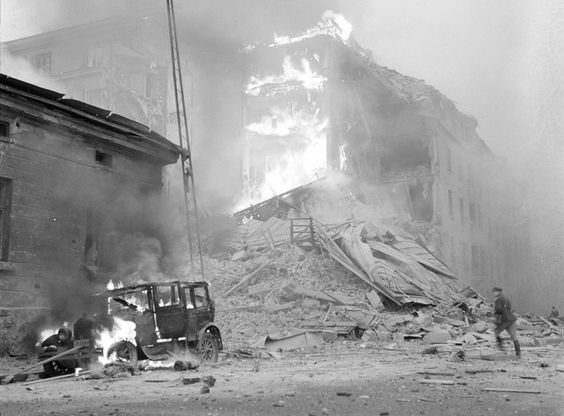 Helsinki bombed on the first day of the Winter War. November 30, 1939 is one of the key, but little noted, dates of World War II. Winter War: According to the terms of the Ribbentrop/Molotov Pact of 23 August 1939, Germany had given the Soviet Union carte blanche to do as it wished regarding Finland. On 30 November 1939, Stalin accordingly invades Finland following the sort of meticulous propaganda preparation, complete with manufactured "border incidents," that most people associate only with Adolf Hitler and Nazi Germany. The Soviet forces under Marshal Kliment Voroshilov, People's Commissar of Defense, open fire at 06:50. They advance quickly into Finland with 21 divisions and a total of roughly 450,000 men in the front lines (amounts vary by source). The attack included a vicious aerial attack on Helsinki, Finland on the first day of the war, another tactic that most people associate with the Nazis and not the Soviets. The Covenant of the League of Nations, ratified by the Soviet Union in 1934. The frontier was over 1,000 km (620 miles) in length, but chains of lakes and vast stretches of difficult terrain in the north effectively limited the axes of advance to the areas directly adjacent to Lake Ladoga. The main conflict occured on the Karelian Isthmus to the north of St. Petersburg aka Leningrad. 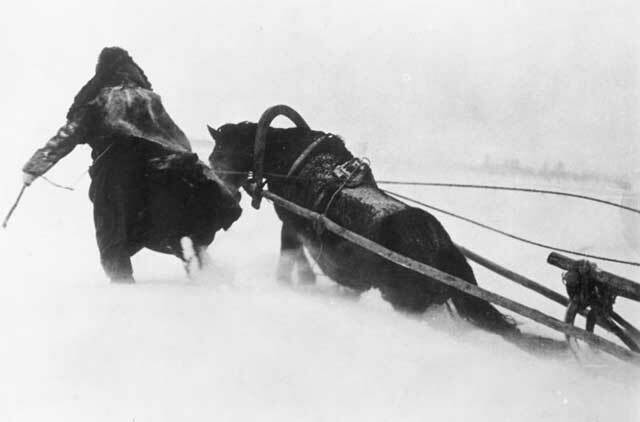 The conflict becomes known as the Winter War. Finnish Government: Taken by surprise by the Soviet invasion despite the staged "provocations," the current Finnish government resigns at midnight. Risto Ryti is named the new Prime Minister, and Väinö Tanner the new foreign minister. Marshal C.G.E. Mannerheim, a World War I hero and descendant of Germany by way of Sweden, already commander-in-chief, is given command of all Finnish Defence Forces and the honorary title "Defender of Finland." 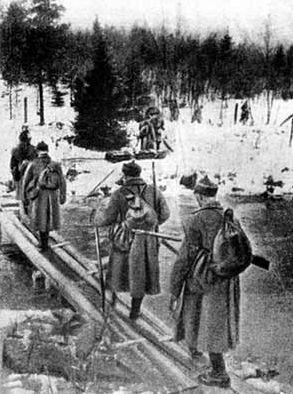 Soviet troops invading the Karelian Isthmus north of Leningrad, 30 November 1939. Soviet Government: Moscow announces the formation of the Finnish People's Government, led by exile Otto Kuusinen, a long-time Comintern member. Winter War Military Operations: The Soviets attack along a broad front, stretching from the Karelian Isthmus north of Leningrad to Petsamo on the Barents Sea. The Finnish military is distinguished by its lack of armor. While this is partly poor planning, the country has endeavored to limit arms production and purchases to maintain the appearance of neutrality. A single Soviet division has more tanks than the entire country of Finland. Soviet 7th Army (General Yakovlev) with 12 divisions attacks on the Karelian Isthmus. Soviet 8th Army (General Khabarov) attacks north of Lake Ladoga. Soviet Ninth Army (General Duhanov) attacks from Soviet Karelia toward the Gulf of Bothnia. Soviet 14th Army (General Frolov) heads east from Murmansk toward Petsamo, which is immediately brought under siege. The Soviet Northern Fleet lands part of the 104th Rifle Division near Petsamo. Finnish forces are anchored on their main defensive line aka the Mannerheim Line, which covers the body of the country. Winter War Air Operations: Soviet aircraft attack Russaro Island. Winter War Naval Operations: Soviet cruiser Kirov and two destroyers bombard Russaro Island. Soviet naval forces land on Selskari Island. plus 1 ship of 706 in the Indian Ocean. One U-boat was sunk, the U-35. British freighter Sheaf Crest hits a mine off the southeast coast of England and sinks. German patrol vessel V-704 hits a mine and sinks. German vessel Widder is converted into a merchant raider. US freighter Extavia is detained by the British at Gibraltar. Convoy OB 44 departs from Liverpool. European Air Operations: Two RAF fighters chase off a Luftwaffe reconnaissance aircraft north of the Firth of Forth. Finland Homefront: The Finns begin evacuating Helsinki, Viipuri and other major cities. Sweden: Swedish volunteers begin signing up to help in Finland. Great Britain: British volunteers begin signing up to help in Finland. British Government: Sir Stafford Cripps leaves for an extended diplomatic tour of India, China and the Soviet Union. German Homefront The number of unemployed is given at 120,000. This compares to about 5 million unemployed in 1932, the year before Hitler took power. 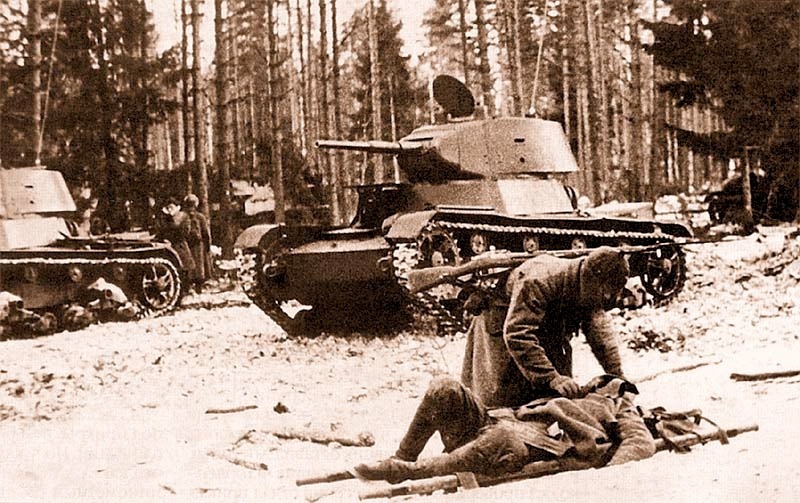 The first Soviet Casualty of the Winter War, 30 November 1939. December 7, 1939: Kollaa Holds!